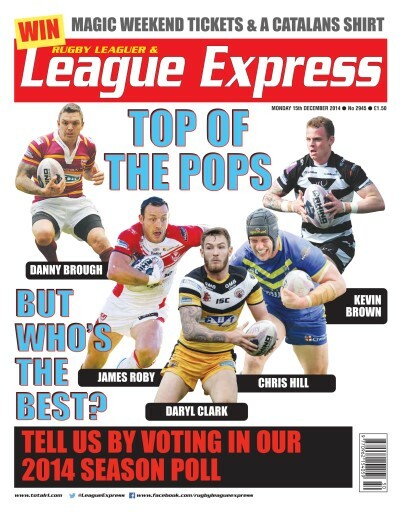 The main feature of this week's League Express is the annual Readers' Poll, whereby our readers are invited to cast their votes for the Super League and Championships Players of the Year, as well as the Young Player of the Year and a host of other awards. And we give those who cast their votes the chance to win tickets for both days of this season's Magic Weekend in Newcastle. 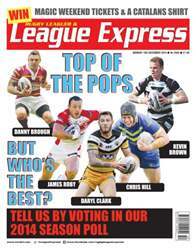 In this week's paper we also have news from every Super League, Championship and League 1 club. And we have a full report and photos from the England Academy's superb victory against the Australian Schoolboys at Leigh Sports Village. We preview the 2015 season for the Catalans Dragons, with our readers having the chance to win a Catalans replica shirt, and we preview the new season for Featherstone Rovers and Keighley Cougars. In our Hall of Fame series, this week we look at the career of Roger Millward - known in his day as Roger the Dodger. We have our regular columnists in editor Martyn Sadler, Hall of Fame member Garry Schofield, Championship correspondent Gareth Walker and our Australian correspondent Malcolm Andrews.